With no waves I'm starting to paddle more. I racked up about 9 miles for www.milesformarines of Stand Up Paddle Surfing yesterday, between the two sessions. Today another 4 miles. Tomorrow I'm planning a 10-12 miler. If the weather was anything like it was this morning it should be a great day for a paddle. Dennis, Norm and myself surfed double of ankle this morning. We still surfed. Josh went up to a point just north of us. No bad days when you Stand Up Paddle Surf. Crazy week. Can't believe it's already Thurdsay. Kyle an'dem are getting ready for the run from Catalina this weekend. We played in some knee high slow surf this morning. Everyone bailed and I cruised up to check out a "safe harbor" so to speak. Dennis was up there catching some waves, I joined him for a while, Jim showed up. Waist high nalus for some morning fun. Later on Jim and I hit the spot again. More wind this time, it took 30 minutes to get there only 10-15 to get back. Waves were the same but choppier. Three laydown surfers bailed as soon as we got there. Don't know why? We usually let the sets roll by and share the ocean. Spot for 'em. Not that I'm not complaining. Waves with just between buddies is the only way to surf. Make friends with everyone and then I guess every session works out. We had a great time. Thanks again to the racing director for opening up the sport of Stand Up Paddle Surfing. Thanks to all the sponsors also. A shout out to Teva from www.islandfourcast.com ! You're the man! Toni came down from Santa Cruz and blazed a path to follow. The San Clemente crew showed up in force, as usual. Kyle, E.J., Dennis, Allen and Jaime, and myself. We had an official unofficial photographer this time, Clayboy- thanks ey. More shots will be posted at www.kingzofthecoast.com soon. Labels: "Stand Up Paddle Surf Events", "Stand Up Paddle Surf Events" "Stand Up Paddle Surf Races"
There was 15 of us in the water this morning, whadda trip. These pictures were after a couple of us got out, but wow- lau lau. This summer is going to be fun. That is what the headline of this morning's surf report would have said if I were to write it. Oh and I all I would have said was, "small". So it was an uneventful day in the surf, but a good friend had a birthday today so it was a great day. Three of us paddled around at kaulapapa's doing the "Hoku" and the newly released"Happy-stance"(Jim says he's visually scarred after it). It's what surfing is all about, hanging out and having fun with friends and ohana. And don't forget we're still Stand Up Paddle Surfing for the Marines For Miles event. You can sponsor the event by clicking below. By sponsoring "me" you're actually sponsoring everyone who puts in the miles. Today's not Sunday, tomorrow is. First thing in the morning I'll be out there if anyone wants to join me. Just before the sun comes up. The tide was a little on it this morning, but waves were to be had. For Stand Up Paddle Surfers there was three of us and Dennis showed up as I was leaving. "They" say a holding NW'er hangs around for a couple more days. There is fun to be had. A quick session. Jim and I hit it, 4-6ft lots of wind, lots of bump but it's been a while since we've had some decent size. Even with the conditions it was good fun. Keep checking back. More photos are coming in from this weekend's race, mahalos Doreen. Stand Up Paddle Surf with Aloha. Great day down at kaulapapa. My wife and I made it a day and we scored. Great little chest high waves, warm air. There was always at least one Stand Up Paddle Surfer out there all day. Clear water to check out the marine life. The dolphins were jumping, the seals chillin' on the inside. During my second session, I saw one leopard shark cruisin' around, he was a good 4-5 footer. Brain and Mark cruised down for a long session. EJ was out for hours. Chad had a couple sessions and his son gave it a try, and looked pretty natural at it. Bob even had a couple Stand Up Paddle sessions. Paul from Mission Beach came up and caught some waves. I posted more pics from this weekends race in Dana Point. But had some tech difficulties. So checkout http://www.kingzofthecoast.com/ when you get a chance and look for the photos from Dana Point Ocean Challenge 2007. Oh and don't forget about the Miles For Marines fund raiser. Go to www.milesformarines.com for more information on how you can help. What a great event! There was close to thirty Stand Up Paddle Surf entries and a separation of classes. The "unlimited" class consisted of boards 14 feet and over, to include any "experimental" hulls of any size. Then there was a stock class, anything under 14'. Plus a wahine class, Tracey and Jaime wrapped that up, one and two respectively, great job ladies! The course was quick and conditions were good. Overall finishers and top three for the unlimited class was; 1st Kyle Mo (on a Ron House standamaran), 2nd Jimmy T (Ron House 14' Coastal Cruiser) and 3rd Ian (on a Bark "Channel Crosser"). Stock division; 1st Eric "Hoku" Tremaine (on a Ron House 12') , 2nd EJ (Ron House 12'), 3rd Brad "B-rad" Rambo (Ron House 12'). Ron House Shapes swept it, even wahine Tracey paddled a Ron House 12 footer. Thanks again to the event directors for a split in classes and just offering up the chance for us Stand Up Paddle Surfers to get involved. Also mahalos for taking the time to make some right-on awards. Thanks also to Dominique and Teva from Hinano for showing the aloha. And many mahalos for Eric Diamond from Honolua Surf Co. for providing all the goodies in the award baggies. And for more info on Stand Up Paddle Surfing go to www.kingzofthecoast.com If you want to know what's upcoming sign up for the emails. And more pictures will be posted at www.kingofthecoast.com later. Hele on! Labels: "Stand Up Paddle Surf Events", "Stand Up Paddle Surf Races"
Yeah before the "in the news" bit. Jim and I had a fun session down at kaulapapas this morning. 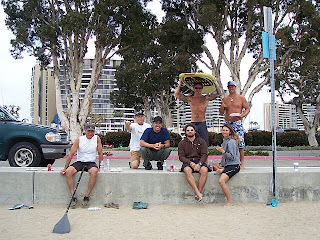 Normal Stand Up Paddle Surf crew there; Ron, Dave, Dennis (paddled to his favorite "secret" spot) Chris. So we had fun, small waves but fun. Right. There is an article in one of the local papers, the SC Times, covering Stand Up Paddle Surfing. Pretty cool article. So I'm curious to hear comments on the article in general and so on. Make a comment if you got one!!!! 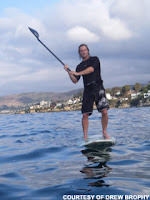 Labels: "Stand Up Paddle Surf in da News"
I finally found them. Big field...but ey, it's a field!? Labels: "Stand Up Paddle Surf Results"
This upcoming weekend's race. 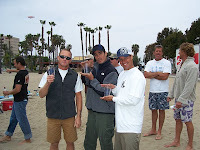 Saturday March 10, 2007, Baby Beach at Dana Point Harbor, registration @ 8am- $20 (includes grinds, shirt and awards). 5 miles short course starts at 9am. And for the first time in Orange County, possibly Southern California, a Stand Up Paddle Surf Class for "unlimited" and stock boards. If you want to get emails about races and events sign up for the emails by clicking here. Labels: "Stand Up Paddle Surf Events" "Stand Up Paddle Surf Races"
Special thanks to Doreen (spelling) for showing up down at Oceanside, what a great surprise. 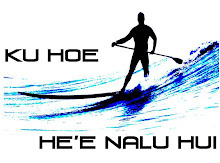 Paddle with Aloha and support those who will give more than we'll even know. "PM Regional Overview: No change from this morning. Still clean and glassy with light winds and poor conditions due to lack of surf. An occasional thigh-waist high wave for standouts"
I laugh because that means nobody in the lineup at all. Dennis, Keith and myself had this little right corner to ourselves this morning (not pictured). Fun tiny, itty-bitty waves BUT we still had good fun. Great conditions, minutes the waves. No line up (of course). Marine life all over. Tracey cruised a flat day paddle solo. Stand Up Paddle Surf is good, gewd! Great training paddle this morning. Kyle and I headed out 6:30ish and froze our fingers off. Winds were cooperating with us both ways, we got lucky and timed it right. As we paddled back in to kaulapapa there were a bunch of Stand Up Paddle Surfers. Ron, B-rad, Norm, Dennis, Jim, a couple others and Boog, our associate pastor from the Shoreline. Coming in from the horizon it was a kick seeing everyone standing up it the line up and stokin' for the nalus. It's been a while. First time back Stand Up Paddle Surfing since Saturday. Kyle and I started for a good distance paddle but the head wind picked up and the surf ended up being real fun so we surfed instead. Dennis paddled up later and we stayed for a few more waves. We had a mini downwind and caught some "outside reef" stuff on the way in, lol. Not much too blog about. In the morning we're doing a long paddle. Meet at kaulapapa's @ 6AM if you like come.